Our USA Necklace United States Of America Cubic Zirconia Red White Blue Pave Pendant featuring the glorious red, white and blue is for anyone who celebrates and supports the United States of America. 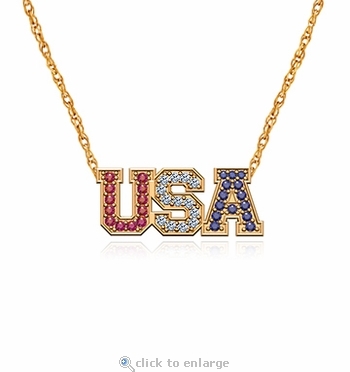 What a great and fashionable way to put your patriotism on proud display. 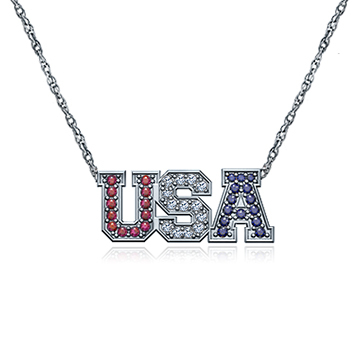 Make a fashionable statement and show your love and support for our wonderful country as a proud American. 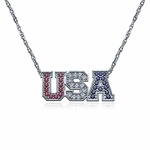 This necklace is a perfect gift for someone who has a loved one in the service or for any American who wants to show their respect for the red, white and blue. The USA necklace measures approximately 20mm in length and 9mm in height. It includes approximately 1 carat in total carat weight of the finest hand cut and hand polished diamond quality cubic zirconia, man made lab created red ruby and laboratory created man made blue sapphires. Choose from your choice of 14k white gold, 14k yellow gold, 18k white gold, 18k yellow gold or precious platinum with a 16 inch fine rope chain. An 18 inch and 20 inch chain length upgrade is also offered. For further assistance, please contact us directly at 1-866-942-6663 or visit us via live chat and speak with a knowledgeable representative.